Saturday’s opponents Cambridge United will be desperate for a huge slice of revenge against the Hatters after being humbled 7-0 at Kenilworth Road, according to striker Danny Hylton. Back in mid-November, the U’s were put to the sword by a rampant Town outfit, with Olly Lee scoring from 70 yards, while Hylton and Elliot Lee both scored braces as well. It’s another game that we’re going to have to be ready for, another team that’s going to be highly motivated. 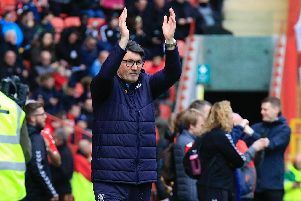 Hylton knows full well they will be using that as part of their pre-match teamtalk when Luton visit the Abbey Stadium, saying: “Of course, a million per cent their manager is going to use that as motivation before the game. “He’s going to say that they owe us one, so it’s another game that we’re going to have to be ready for, another team that’s going to be highly motivated. Town defender Alan Sheehan was of a similar viewpoint too as when asked if that result will still be hurting the United squad, he said: “Definitely. A lot of the players that played that day will be playing and be desperate to do one over on us. “We know it’s going to be a tough game. We’ve got 12 games to go and it’s harder to win at this time of the season because everyone’s fighting for something. “Sometimes players are going for the play-offs, or automatic (promotion), trying to avoid relegation and get safe. Hylton confirmed that both he and the players are keeping a keen eye on the goings on in League Two as well, with his side’s lead down to just three points from Accrington Stanley. They remain seven points clear of Notts County in fourth though, as Hylton said: “It’s only natural you do that. “Of course we check all the other results the minute you come off the pitch, but as long as we do our job, it doesn’t matter what others do. “Wycombe lost and Mansfield drew, so that point (against Cheltenham) was a good point. Our main thing is to get promoted, to stay in that top three. “There’s still a decent gap there, with goal difference it looks healthy, so we’ll keep trying to do that.